The Weekly Specials this week include products from Colt, H&K, SCCY, Kel-Tec, Sig Sauer, EAA, Citadel and this Beretta M9A3. 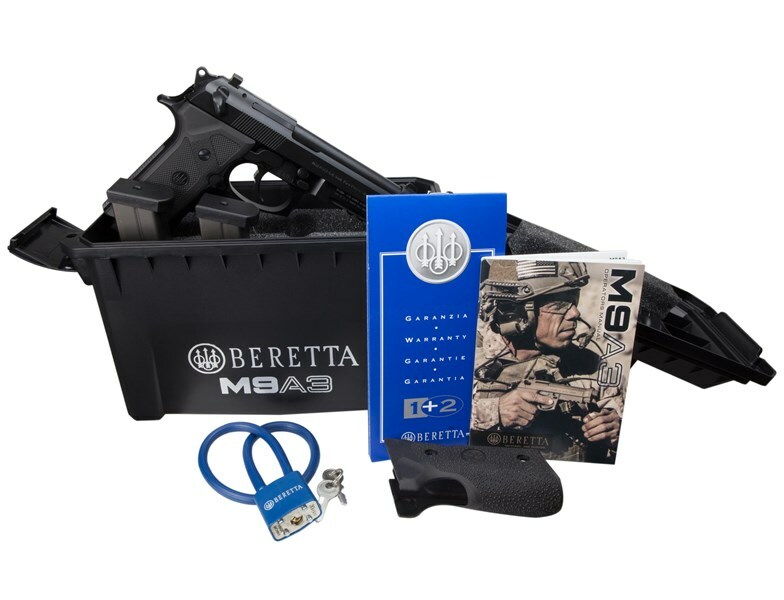 Based on military feedback, Beretta has designed the newest member of the M9 family, the M9A3 9mm pistol. The M9A3 delivers all of the critical features that today's combat professionals require in demanding environments. The M9A3 was designed to deliver the performance that military, law enforcement and consumers demand. in short, this combat pistol was designed to perform exceptionally in any tactical or home defense situation. The Beretta M9A3 features 5.2 inch barrel threaded 1/2x28, MIL standard three slot 1913 Picatinny rail, lighter trigger pull, reversible oversized magazine catch, beveled magazine well, front and back-strap checkering. The pistol ships in a unique ammo can and includes three 17rd magazines, both thin grip panels (installed) and a wrap-around backstrap grip (not installed).